The D90 is Nikon's new enthusiasts' DSLR, but is there really a big enough gap between the amateur D60 and the pro-spec D300? The Nikon D90 is a direct replacement for the D80, and it does feel as if it's been a long time coming. After all, the D80 was starting to be a little embarrassed by the cheaper D60, which has the same resolution, a bigger LCD and a new, image-stabilised kit lens. 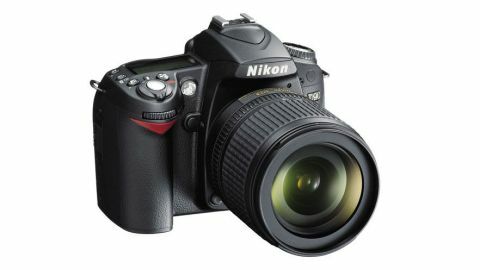 The Nikon D90's body is much like the old D80's. It's fatter and chunkier than the D60's and easier to get a good grip on. It has twin control dials, which may be confusing at ﬁrst, but is much better when making aperture and shutter speed adjustments. Handling advantages aside, there's a lot more in this camera to tempt users away from the D60. The 12.3-megapixel CMOS sensor uses technology 'inherited' from the D300, which seems a careful way of suggesting it might not be quite the same, though there's nothing in the speciﬁcations to suggest any differences. The ISO range runs from 200-3200, but can be 'expanded' at either end to 100 or 6400. Recent Nikon SLRs have demonstrated excellent high ISO image quality, so this was ﬁrst on the list of features to be tested. The continuous shooting speed is 4.5fps maximum (with a high-speed memory card), and the 11-point AF system is substantially more sophisticated than the 3-point system of the D60. The switch to a CMOS sensor means the D90 now boasts a Live View mode, and this does, incidentally, look terrific, thanks to the excellent 3-inch, 920,000-dot LCD. The 'self-cleaning' sensor unit should also keep dust worries to a minimum. And the last major difference is the arrival of a new 18-105mm VR kit lens. No doubt retailers will be supplying other conﬁgurations, too, but this is the one that offers the best deal by far. Given all of this, it's possible the D90 is being compared to the wrong camera. It's clearly streets ahead of the D60. In fact, it's so good, that it's perhaps more of a threat to the D300. No, it doesn't have the D300's tank-like build, but it feels sturdy enough and it's easy to carry around. Perhaps the real question is: what can the D300 do that the D90 can't? Nikon claims the shutter in the D90 is designed for 100,000 cycles (something of a professional benchmark), and its power- management system means the battery should be good for no fewer than 850 shots between charges. The D90 is also the world's ﬁrst DSLR with a Movie mode. With a maximum resolution of 1,280 x 720 pixels at 24fps, it trounces all but a few digital compacts, it makes MiniDV camcorders look a bit sick and it might even steal a few sales from HD camcorders. There are limitations and drawbacks with this Movie mode, but it's still impressive (in fact, we're devoting a two-page spread to it after this review). The D90's control layout will be familiar to anyone who's used a Nikon DSLR before. The power switch is a spring-loaded lever around the shutter button and the start-up time is so short as to be essentially instantaneous. There's a mono status LCD on the top plate, so while the rear LCD can be used for checking the settings, it's most likely going to be conﬁned to displaying images in Playback and Live View modes. The only problem with the status LCD is that some of the icons are pretty small. The 3-inch LCD on the rear, though, is something else. It's not just the size that's impressive, but the saturation, clarity and sheer deﬁnition. It can get swamped a little in bright light, but mostly it's really easy to make out. However, there are a couple of minor issues here. The ﬁrst is that it's so bright and vivid that it ﬂatters to deceive. Pictures which look breathtaking on the rear of the camera can turn out to be surprisingly ordinary when you load them up on the computer. The other issue is that it's ﬁxed in position. While you might overlook the fact that the usefulness of the Live View mode is slightly reduced as a result, the difficulty of composing movies on a ﬁxed LCD quickly becomes obvious. It's the same with most compact cameras, true, but if you're tempted to compare the D90 with a proper camcorder, this is a deﬁciency. Overall, the Nikon D90 feels like a quality camera. And the new 18-105mm VR kit lens complements it perfectly. Its weight and size is just right for the D90's body, producing a nicely balanced combination. The zoom action is smooth and quite light, but there's no 'slop' or 'creep'. The manual focus ring feels faintly tacky, but in general this lens feels really good. It's a pretty unreserved thumbs-up so far, then, and the only thing left that could let the D90 down is its image quality, but even this is bang on the button. The exposures are great, the colour rendition is excellent and the auto white balance is very good, especially under artificial lighting. And the high ISO performance? Stunning. The deﬁnition of the 18-105mm lens is good and, perhaps more important, it's consistent right across the frame and across the focal range too. There's certainly no particular 'sweet spot' in the aperture or zoom range you need to stick to. Interestingly, there was almost no chromatic aberration when this lens was used on the Nikon D90, but there was when it was tried on a D50 body. Is Nikon applying a correction via the in-camera image processing? There are signs that Panasonic, for example, may be doing something similar on some of its cameras.The answer to that question isn't clear, but what is clear is that the D90 is an excellent mid-range DSLR. Canon fans might prefer the more streamlined design and handling of the EOS 40D, say, while others might be swayed by the depth and dynamic range of the images from the Pentax K20D. Really, though, the Nikon D90's features, performance and value are so immense that it has to be given one of our all-time highest scores.